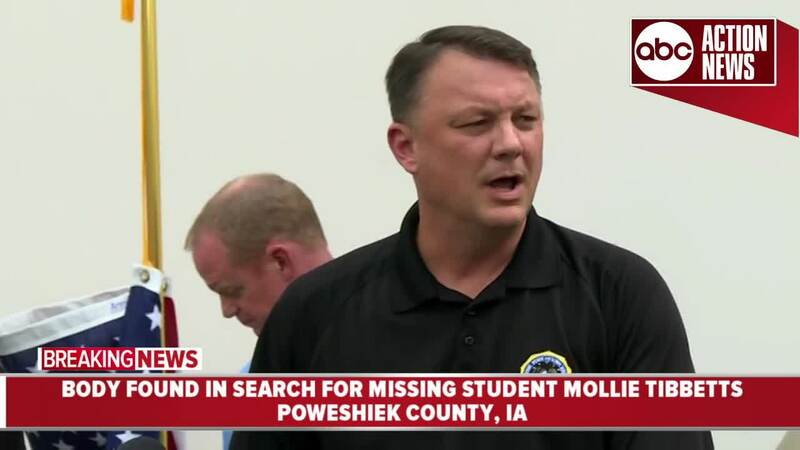 MONTEZUMA, Iowa — Iowa officials say that a man living in the United States illegally has been charged with first-degree murder in the death of Mollie Tibbetts. According to officials, security cameras were able to capture video of Tibbetts, 20, running the day of her disappearance. Those same cameras showed a dark-colored Chevy Malibu driving in the area. Authorities determined that the vehicle belonged to Cristhian Rivera, 24. Officials quickly realized he was one of the last people to see Tibbetts running. Investigators interviewed Rivera on Monday, more than a month after her disappearance. He allegedly told them that he was in his car when he saw Tibbetts running. At some point, he got out of his car and began running alongside of her or behind her. Rivera stated that Tibbetts told him to stop following her or she was going to call the police. According to an arrest affidavit, Rivera said he realized that he had put Tibbetts' body in his trunk after he noticed an earpiece from headphones on his lap. He said that when he went to get her out of his trunk, he noticed blood on the side of her head. In the interview, investigators say Rivera described dragging Tibbetts on foot from his vehicle to a secluded location in a cornfield. Police say that after they finished interviewing Rivera, he took them to the location of Tibbetts' body. Tibbetts' body was found on Tuesday in the cornfield in Brooklyn, Iowa, with corn stalks placed on her. The body still needs to be officially identified by the coroner. Law enforcement confirmed through Homeland Security that Rivera is from Mexico has been living in the U.S. illegally for four to seven years. Rivera has been charged with first-degree murder. His bond was set at $1,000,000.